Here are some selected research projects that I have initiated and led. Building Energy Management: Buildings are huge consumers of energy. In fact, in the U.S., buildings account for 40% of all energy use, and contribute about 8% of the global carbon dioxide emissions. At the same time, they present numerous opportunities for energy savings, e.g., it has been reported that poorly maintained, degraded, and improperly controlled equipment wastes 15-30% of energy in commercial buildings. How can data science help in realizing some of these opportunities? This work addresses multiple challenges to energy management in commercial buildings, including 1) meter placement, 2) anomaly detection, 3) demand forecasting, and 4) occupancy modeling. Large-scale graphical model inference: We design and implement a scalable version of loopy belief propagation (BP), a widely used algorithm for performing inference on probabilistic graphical models, including in applications related to fraud detection, malware detection, computer vision, and customer retention. However, implementations of BP on generic data processing platforms such as Apache Spark do not scale well to very large graphical models containing billions of vertices. To handle such large-scale graphs, we leverage a number of strategies. Our implementation is based on Apache Spark GraphX. We propose a novel graph partitioning strategy to reduce both computation and communication overhead providing a 2x speed-up. We use efficient memory management for storing the graph and shared memory for high-speed communication. To evaluate performance and demonstrate scalability of the approach, we perform a range of experiments including using real-world graphs with billions of vertices, where we achieve an overall 10x speed-up over a vanilla Spark baseline. Further, we apply our BP implementation to infer the probability of a website being malicious by performing inference on a graphical model derived from real, large-scale hyperlinked web-crawl data. We have open sourced our implementation. Robust, Large-scale Sensor Anomaly Detection: Large-scale sensor networks are ubiquitous nowadays. An important objective of deploying sensors is to detect anomalies in the monitored system or infrastructure, which allows remedial measures to be taken to prevent failures, inefficiencies, and security breaches. 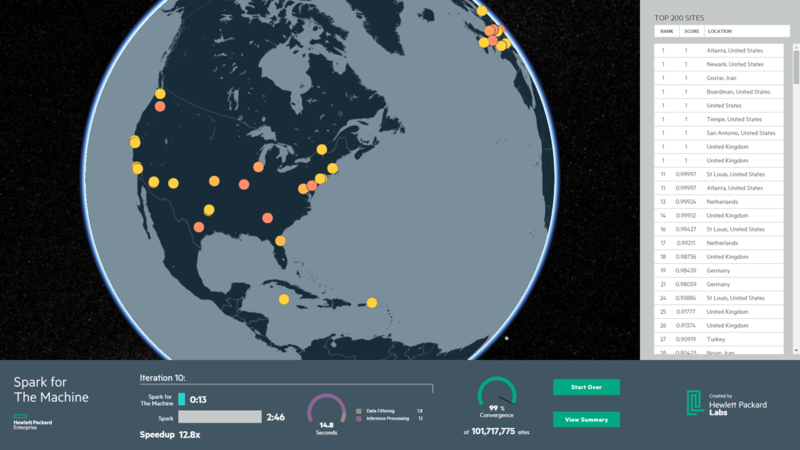 Most existing sensor anomaly detection methods are local, i.e., they do not capture the global dependency structure of the sensors, nor do they perform well in the presence of missing or erroneous data. In this work, we propose an anomaly detection technique for large scale sensor data that leverages relationships between sensors to improve robustness even when data is missing or erroneous. 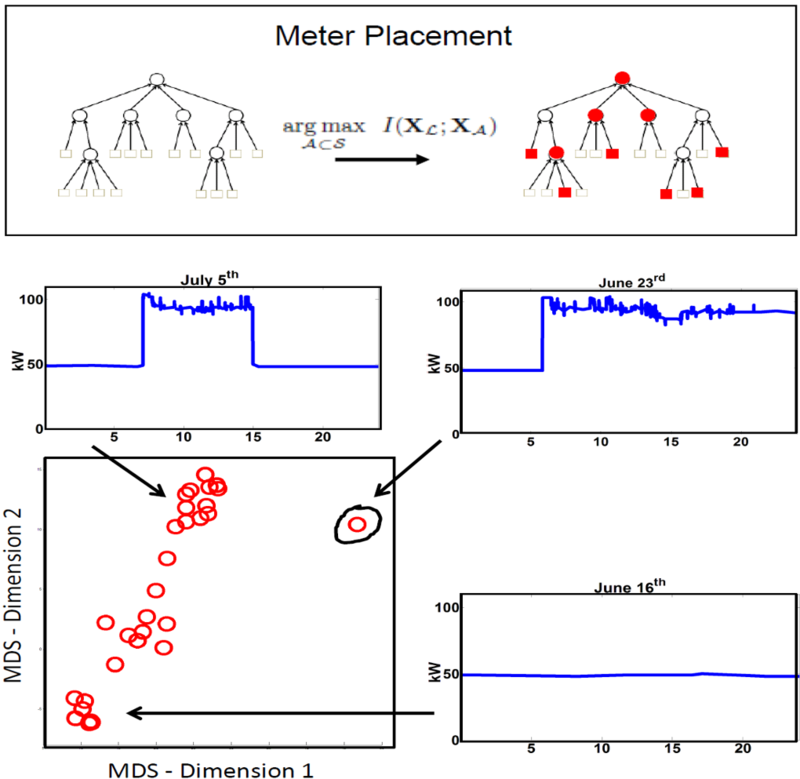 We develop a probabilistic graphical model-based global outlier detection technique that represents a sensor network as a pairwise Markov Random Field and uses graphical model inference to detect anomalies. We show our model is more robust than local models, and detects anomalies with 90% accuracy even when 50% of sensors are erroneous. We also build a synthetic graphical model generator that preserves statistical properties of a real data set to test our outlier detection technique at scale. Energy Disaggregation: A problem faced by electricity consumers is that utility bills, usually received at the end of a month, provide only aggregate usage with no insight on which appliances/devices were the top consumers. It has been shown that providing a breakdown of consumption helps users curtail their usage typically by 9-20%. Without installing a meter on every appliance, how can an appliance-wise breakdown be inferred from a single whole house electricity measurement that is provided, say, by a smart meter? This problem is called energy disaggregation or non-intrusive load monitoring (NILM), and in light of sustainability has recently attracted a lot of attention from data mining researchers and practitioners. We proposed an unsupervised approach to energy disaggregation based on a factorial hidden Markov model (FHMM) that uses low frequency aggregate measurements from a smart meter [SDM 2011]. We proposed FHMM variants that better capture the probability distributions of appliance ON durations, and that allow additional contextual features such as hour of day, day of week, and input from other sensors to be incorporated into the model. We were the first to use a FHMM based approach, which has subsequently been used by several researchers. In [AAAI 2013], we propose a motif-based approach to energy disaggregation for residential and commercial buildings. This paper received the best student paper award at AAAI 2013 computational sustainability track. Auto Life Cycle Assessment: Lifecycle assessment is a widely used method to estimate the environmental impact, such as greenhouse gas emissions and toxicity, of a product (e.g., server, handheld). However, it is a manual and laborious process. We propose several methods to automate this process and reduce the cost and time associated with environmental assessments. The data set consists of the product's bill of materials, and a commercially available database of environmental impacts of commonly used components. The environmental impacts database is essentially a matrix, and we use collaborative filtering techniques to impute missing data; we use a series of clustering, classification methods on the bill of materials to transform it to the impact factor space; determine the component tree in the impact factor space and the top contributors of a particular environmental impact; and finally, use disparate clustering to suggest alternative components for more sustainable design. Photo-Voltaic Power Generation Prediction: Local and distributed power generation is increasingly reliant on renewable power sources, e.g., solar (photovoltaic or PV) and wind energy. The integration of such sources into the power grid is challenging, however, due to their variable and intermittent energy output. To effectively use them on a large scale, it is essential to be able to predict power generation at a fine-grained level. In this work, we propose a novel Bayesian ensemble methodology involving three diverse predictors. Each predictor estimates mixing coefficients for integrating PV generation output profiles but captures fundamentally different characteristics. 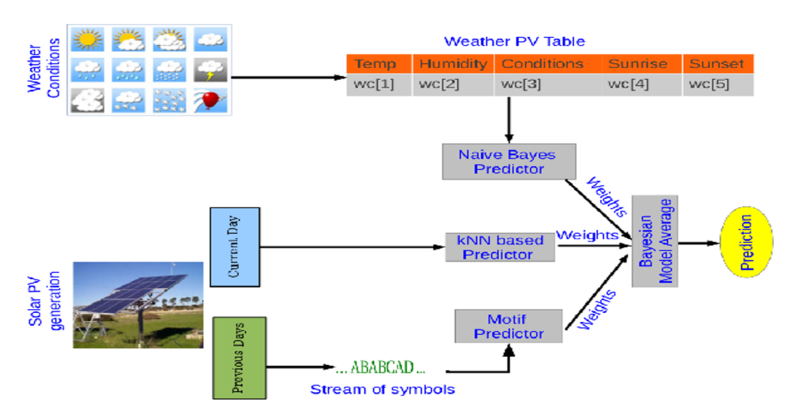 Two of them employ classical parameterized (naive Bayes) and non-parametric (nearest neighbor) methods to model the relationship between weather forecasts and PV output. The third predictor captures the sequentiality implicit in PV generation and uses motifs mined from historical data to estimate the most likely mixture weights using a stream prediction methodology. We demonstrate the success and superiority of our methods on real PV data from two locations that exhibit diverse weather conditions. Predictions from our model can be harnessed to optimize scheduling of delay tolerant workloads, e.g., in a data center. Auto Thermal Correlation Index: In order to better manage the cooling infrastructure in a data center with multiple computer room air conditioning (CRAC) units, the relationship between CRAC settings and temperature at various locations in the data center needs to be accurately and reliably determined. Usually this is done via a commissioning process which is both time consuming and disruptive. In this paper, we describe a machine learning based technique to model rack inlet temperature sensors in a data center as a function of CRAC settings. These models can then be used to automatically estimate thermal correlation indices (TCI) at any particular CRAC settings. We have implemented a prototype of our methodology in a real data center with eight CRACs and several hundred sensors. The temperature sensor models developed have high accuracy (mean RMSE error is 0.2 C). The results are validated using manual commissioning, demonstrating the effectiveness of our techniques in estimating TCI and in determining thermal zones or regions of influence of the CRACs. Data Center Chiller Temporal Data Mining: Practically every large IT organization hosts data centers-a mix of computing elements, storage systems, networking, power, and cooling infrastructure—operated either in-house or outsourced to major vendors. A significant element of modern data centers is their cooling infrastructure, whose efficient and sustainable operation is a key ingredient to the "always-on" capability of data centers. In this work, we designed and implemented CAMAS (Chiller Advisory and MAnagement System), a temporal data mining solution to mine and manage chiller installations. CAMAS embodies a set of algorithms for processing multivariate time-series data and characterizes sustainability measures of the patterns mined. We demonstrate three key ingredients of CAMAS—motif mining, association analysis, and dynamic Bayesian network inference-that help bridge the gap between low-level, raw, sensor streams, and the high-level operating regions and features needed for an operator to efficiently manage the data center. The effectiveness of CAMAS is demonstrated by its application to a real-life production data center.